We sat on her family room couch, sorting through her photos. Occasionally, one of us would stop and show the other a photo, laughing or reminiscing about the story behind it. I felt like a kid again, sitting in my childhood home and reliving old and happy memories with my mom. Then she paused, her fingers resting on a photo. The smile had vanished from her face. “What? What is it?” I asked. I noticed her demeanor had changed. “Me too,” she said, as she slid the picture from her fingers into my hand. I sat and studied the photo for what seemed to be an eternity. She was sitting upright in a chair next to the bed in her hospital room with a pillow draped over her lap. The hospital gown barely covered all that was coming out around her. A tube was coming out of her nose and another one was coming out of her neck. Looking at the photo seemed to leave my mom in some sort of disbelief. She had no recollection of the days following this surgery, and although the photo looked like her, she acted as if she had just seen a ghost. I knew it was my mom in the photo, but I also thought she looked like a shell of the woman I have always known. Her pain was so intense after this surgery that I can only describe the look in her eyes as empty pain. It’s the kind of pain that demands complete submission to it. And there she was in a photograph, a memento of pain. She and I had a haunting glimpse of a time from two years ago that we would both prefer to forget. It was the first time I seriously doubted whether or not my mom would make it through a surgery. This surgery was different than the ones she had previously. This was a rare procedure that required a skilled surgeon and wouldn’t guarantee her a better future or survival. When faced with such uncertainty, I thought about the holidays we had shared over the last year and wondered if we had truly enjoyed those moments together. I didn’t want to think about having the next holiday without her. It also made me think about my own selfishness and the times I didn’t grasp what life has been like for her. As long as I can remember, my mom has been battling an invisible enemy. She was born in 1953, and in 2008, she finally found out what has been causing her lifelong pain. She has a hard to detect birth defect called pancreas divisum (an abnormality of the ducts of the pancreas) and sphincter of Oddi dysfunction (a dysfunction of the muscle that help control the flow of pancreatic juices). This and the treatment of which caused chronic pancreatitis. These abnormalities caused the symptoms she has felt since childhood: pain in the upper right quadrant of the abdomen or in the back, epigastric pain (especially after meals), abdominal swelling, nausea and/or vomiting. All of these symptoms during her lifetime were mistaken for various other ailments, so my mom spent 55 years of her life undiagnosed. She hugged me and we sat silently, maybe pondering the moments we lost. Her story has touched me more deeply in the last year. I was recently diagnosed with rheumatoid arthritis and I, too, will most likely be dealing with a lifetime of chronic pain. The difference between her story and mine is defined by one word: diagnosis. When my blood was drawn last year, I didn’t want a diagnosis but once I got it, I was validated. My pain wasn’t an illusion and I could begin treatment. My mom had spent most of her adult life chasing a diagnosis. So why was it so hard for her to chase a diagnosis? The hospital and medical bills became a rotating door for my mom even though she and my dad were already struggling financially. Money wasn’t the only reason she was discouraged from returning to the hospital or seeking out another specialist. She frequently heard comments like, “If they can’t find anything wrong, then what is it?” or “You don’t look sick.” And all the while she would feel discouraged and invalidated for her chronic pain. Years of hearing others’ doubts made her doubt herself and that led to depression. When my mom finally had diagnosis in hand, the only treatment available was risky and didn’t guarantee a better quality of life. 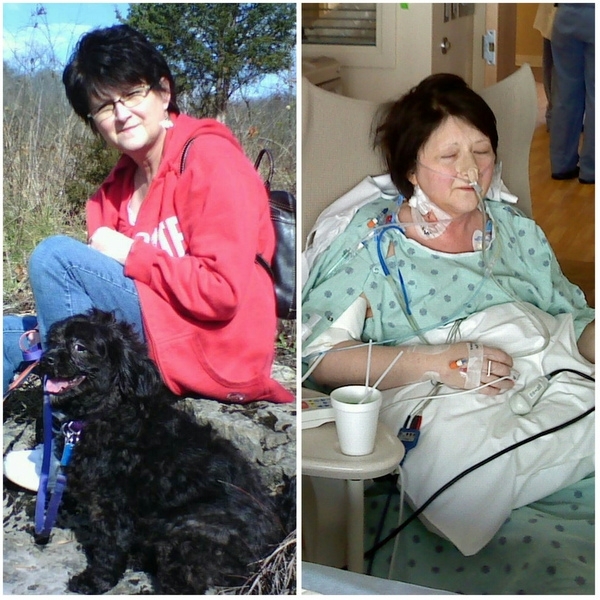 The first procedure landed her in the hospital with acute pancreatitis. I visited her during this acute flare in 2008. Her pain was so intense that she was given large doses of pain medications and food was withheld until her pancreatic levels decreased. When I saw her, she was out of her head and desperate for food. Every year since 2008 is speckled with memories that she and I would rather forget. Awful memories where my mom and I began having an unspoken understanding about her health and death. These moments would shame the people who doubted her illness and her pain because she wasn’t constantly folded over from it. It would shame those who were perplexed because they couldn’t see her disability with their eyes. I heard what she said but doubted the truth in it. I didn’t have the same difficulty before I had my answers. There are many people, like my mom, who are chasing a diagnosis. They spend every day in real pain and are desperate for answers. They persevere even if they have to do it alone. My mom did what she knew was right despite adversity. Fighting the unknown is one of the bravest battles one can face. She isn’t the only undiagnosed individual fighting for answers, so don’t judge someone based on outside appearances or speculation. Offer support because even when someone is fighting the unknown, they are still fighting. Follow this journey on CrossRoadTrippers. My husband and I have four children. We have numerous daily challenges. Our youngest son suffers from epilepsy (including Infantile Spasms) and developmental delays because he is severely effected by a genetic disorder called Tuberous Sclerosis Complex. Seven years after our son’s diagnosis, I was diagnosed with Rheumatoid Arthritis and Fibromyalgia. I write because I don’t want anyone to feel as alone as my husband and I did the day we learned our son had a life altering disease, or as alone as we often feel struggling with multiple diagnoses within our home. It is difficult for me to share my life with others, but my hope in doing so is to reach someone across the digital divide and say, “You are not alone.” Our challenges can certainly tear us down, and at times they have, but we hope the lessons of which can better our lives. I can only hope to help others by sharing our experiences.